You are protected by our 30 Day Money Back Guarantee. License entitles 1 year of support & updates. Extend support & updates after 1 year at 20% discount. Looking for the easiest & efficient way to integrate FedEx Shipping Rates, USPS Shipping Rates & UPS Shipping Rates with your WooCommerce Store? Tired of copying and pasting order details just to create a Shipping label? 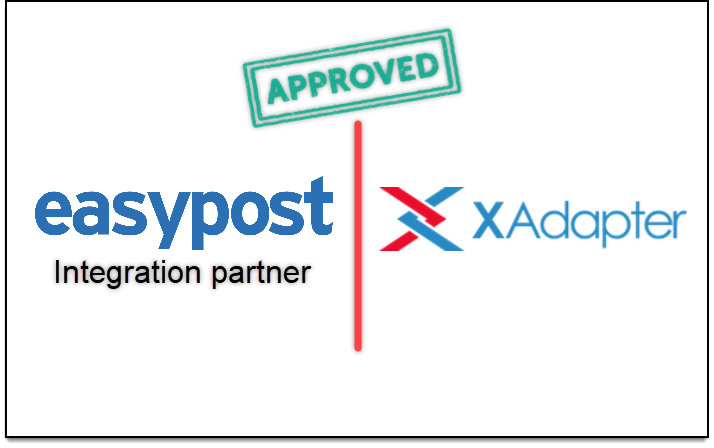 Here is the solution from ELEX (XAdapter); an EasyPost Approved Integration Partner! Our ELEX EasyPost (FedEx, UPS & USPS) Shipping Method Plugin for WooCommerce (previously known as XAdapter EasyPost Shipping Plugin) is a WordPress/WooCommerce extension that helps you to completely automate WooCommerce UPS, WooCommerce USPS, and WooCommerce FedEx shipping using EasyPost APIs by displaying shipping rates on cart/checkout page, pay postage and print label from within your WooCommerce Store. Step 1: Install the Plugin, input your EasyPost Account details and enable EasyPost Shipping Method for WooCommerce. Step 2: Customer sees USPS/UPS/FedEx shipping rates provided by EasyPost, based on items in their cart before placing an order. Step 3: Pay Postage, Print Label, and Generate Tracking information from within the WooCommerce order page. 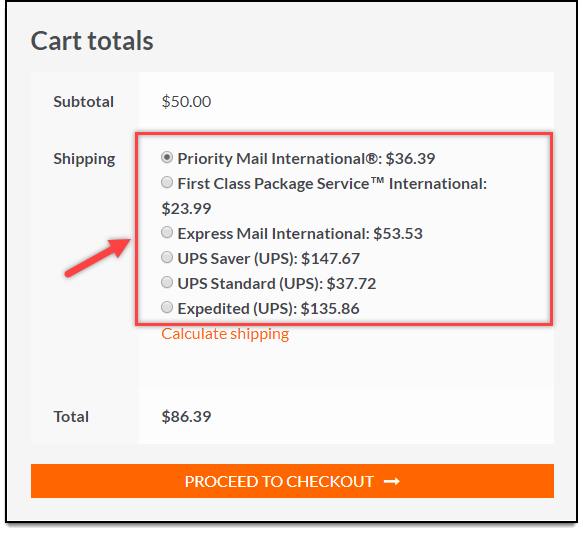 Based on the product weight, box dimensions, shipping destination, etc., this plugin fetches UPS, USPS or FedEx postage rates from your EasyPost account for both domestic and international shipping services. The returned services and rates will be displayed on the Checkout page. 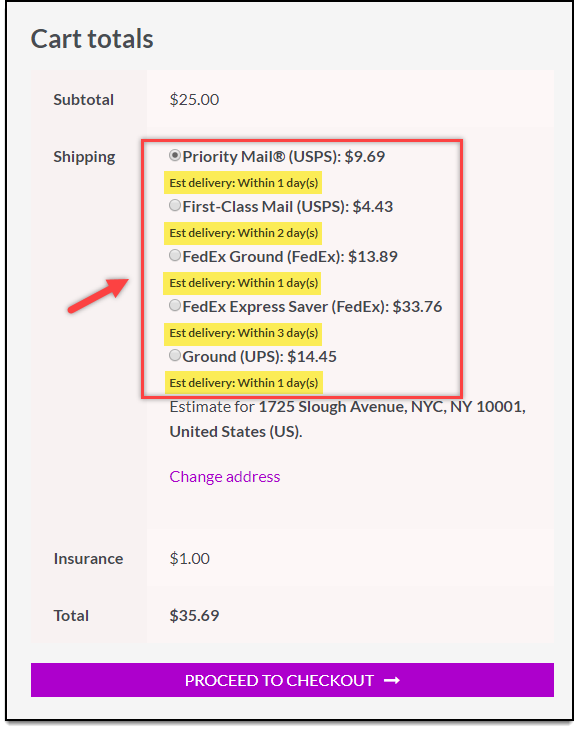 Print shipping labels from within the WooCommerce order admin page. After logging in to the WordPress admin area, you can create a shipment by clicking on the ‘create shipment’ button on the right-hand side of the order details page. Shipment details would automatically be sent to EasyPost online account, and then the shipping label would be generated, which you can then print. Postage is automatically paid on these labels using your EasyPost account. There is an option to change the shipping service and box/parcel dimensions (if enabled in the plugin settings) manually before generating labels. This plugin integrates with EasyPost APIs to print domestic or international shipping labels with a tracking barcode. Although you can create shipments in bulk in the WooCommerce Orders Page, you can use the bulk label printing add-on to create multiple shipments at once as well as print them in a single PDF file. If you wish to take out the overhead of generating shipping labels manually, you can try our auto-generate and email labels add-on. You can also print return labels using our return label add-on. 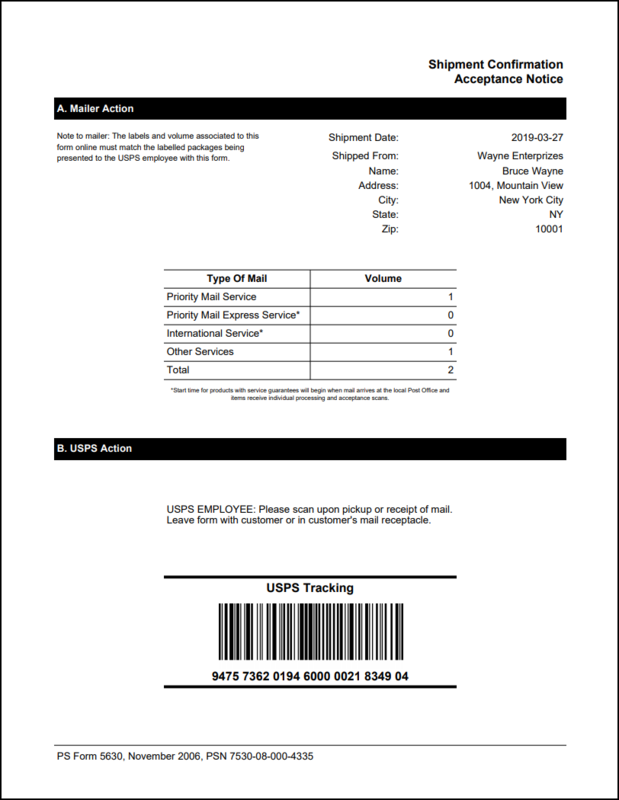 The USPS/UPS/FedEx tracking number returned from EasyPost while generating the label would be added to order notes and will be sent as part of the order completion email. This enables Shipment Tracking for customers as well as shop owners. USPS Flat Rates are hardcoded in our WooCommerce EasyPost plugin. There are no USPS API calls made to get Flat rates.e plugin has inbuilt USPS Flat rates. You can select any of the Flat rate boxes and proceed with shipping without any hesitation. Configure handling fees for each shipping service, in terms of amount or percentage value. A positive value results in markup, whereas negative value results in a discount. Based on the weights and dimensions of the products in the cart, the rate will be calculated and applied to the final price of the order. Once the order is placed, the items will then be automatically packed into the configured boxes. If a customer wants to secure their items, they can add an insurance option to the package. Once you enable Insurance option in the plugin settings, customers will get a checkbox to apply insurance to their package, at the Checkout (as shown in the screenshot). The insurance amount is calculated as 1% of the total product(s) amount. Show your customers an estimated number of days on which the package will be delivered to the given shipping address. Once enabled, the cart and checkout pages will display the estimated days as per the API’s returned data. With the help of EasyPost Bulk Label Printing Add-On, you can generate shipping labels in bulk and download them in a single PDF file. 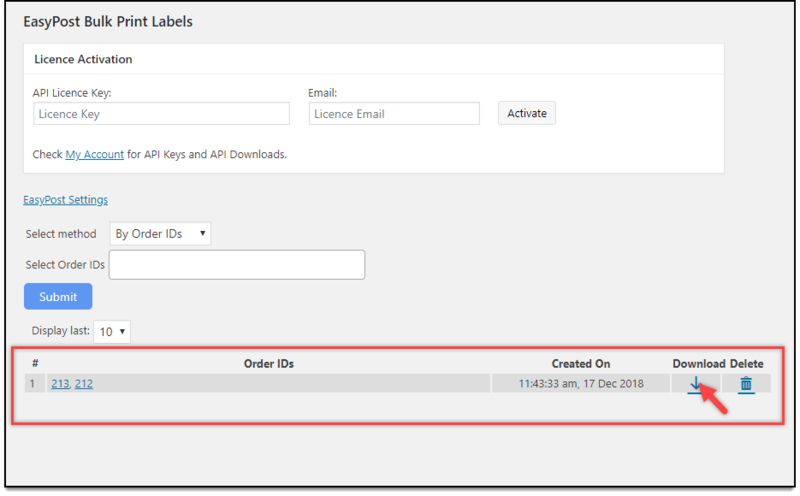 You can bulk print labels using WooCommerce Order IDs or Order date range. This saves a lot of your time on printing labels one at a time. The EasyPost Auto-generate and Email labels Add-On makes your label generation task easier by automatically creating shipments, generating labels, and sending an email notification with the shipping label, for you and your customers. This saves your time on manually generating shipping labels. 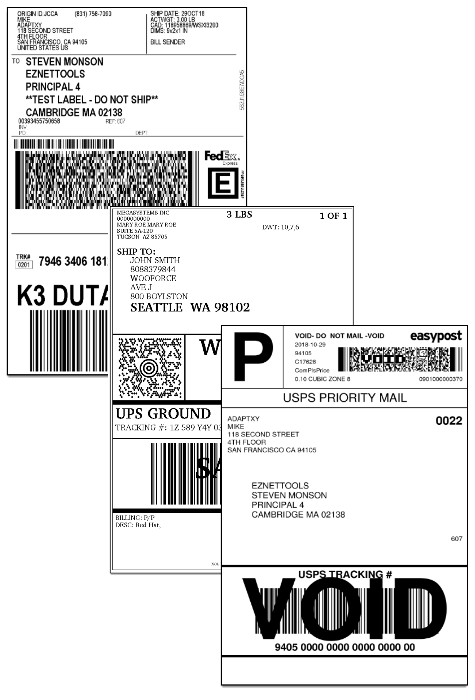 Using our EasyPost Return Label Add-On, you can generate return labels for FedEx, UPS, and USPS. 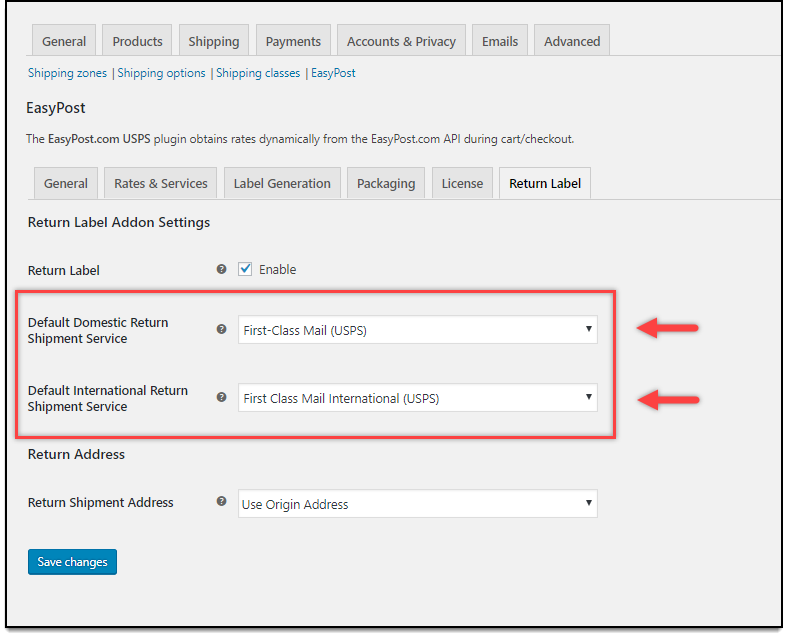 You can configure default domestic and international services and set custom return address for handling returns. 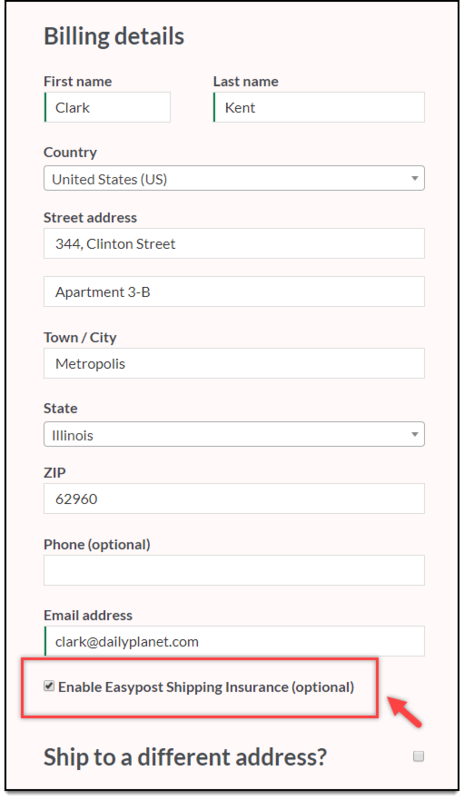 With the ELEX WooCommerce EasyPost Generate SCAN Forms Add-On, you can easily generate USPS SCAN forms returned from EasyPost. You can generate a single SCAN Form for multiple packages, instead of generating a shipping label for each package. This will make your shipment processing a lot faster and easier. EasyPost is a flexible, modern Tracking API that makes it easy to add tracking and shipping to your app. Sign up and start shipping, Now! Thousands of developers already have. EasyPost was founded in 2012 as the first RESTful API for shipping. EasyPost has thousands of customers shipping millions of packages each month. EasyPost’s customers range in size from public companies to SMBs. EasyPost allows business to integrate tracking statuses, address verification, label purchasing, rating, and more from DHL Global Mail, FedEx, UPS, USPS, and other regional carriers into their site or application. When you create a shipping label with EasyPost, you pay just very nominal amount per package. You can use an EasyPost label to ship with any of the supported carriers. All other API calls to EasyPost are free. For just Tracking API and Webhooks, you get the first 500 tracking numbers per month free. 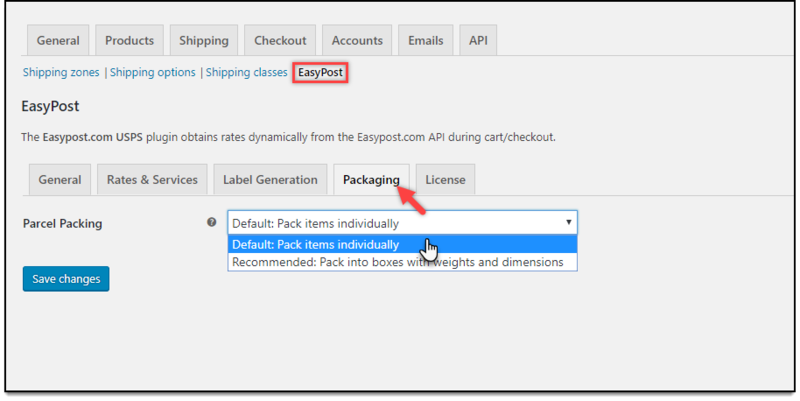 If you’re purchasing shipping labels through EasyPost, all Tracking API functionality is free. EasyPost has no setup fees, monthly fees, or cancellation fees. Just pay for what you use and scale as much as you need. For USPS, all accounts receive a USPS Commercial Plus Pricing, and EasyPost charges you directly via bank account or credit card for anything you ship. For UPS and FedEx your carrier account information in minutes via EasyPost website. All billing for packages will continue through your carriers with your negotiated rates. For the integration to work, you need to enter user credentials in the settings screen of EasyPost plugin. For obtaining EasyPost credentials, you have to sign up for an EasyPost account. This plugin makes life so much easier and technical support is always on top of things to help you out. Great plugin, wonderful support and response time. Very helpful plugin. I contacted the support team regarding a couple bugs and they released a fix in just a few days! Good doing business with you guys. Plugin (and the level of support) are great.I had an issue where I wasn’t setting the box weights correctly. I had weight and max weight both as high values. Note to anyone else w/ this issue: set the box weight to 0 or a very low value, then max-weight to the actual max-weight. After this was corrected, I saw my boxes being selected correctly based on the individual order items.Thanks, this info really saved me! You Want To Try It For Yourself? Check out the Live Demo. Check out our documentation on Setting Up, Trouble-shooting, FAQs & Code Snippets. Want to Consult Us on a Unique Case or Got a Question? Contact us. We will be Quick! What happens when the one year license expires? After the plugin’s one year license expires the plugin will continue to work as normal but the download permission will be revoked so the updates for the plugin will stop. You can always renew the license at a 20% discount which will be provided on request. Can I use Thermal printer using this plugin? If your printer supports the PDF format for labels, then It will work fine. But we don’t have the option to choose the label format as ZPL or EPL. Can the plugin send the label to the customer automatically so that they can send their product to us for repair? The plugin has the option only for outgoing shipments. We don’t have the option for return shipments. Can I use the plugin with the multi-vendor plugin? Unfortunately, this plugin does not work in a Multi-vendor environment. Will EasyPost pick up the packages or do I need to drop them at the postal office? Our plugin does not have the pickup request option. So you can either set a regular date when they come and pick up the package or request from web service. Or you can call them directly for pickup. But it is advisable to clarify with the EasyPost team regarding the pickup. 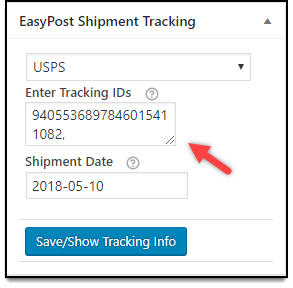 Can tracking numbers be entered into the order manually without creating a packing slip? Yes, you can add the tracking number manually and click on save/show tracking information. Once you mark the order as completed, it will send that tracking number with a tracking link to the customer. Can I generate return labels for UPS, USPS & FedEx? Yes, you can use our EasyPost return label add-on in addition to this plugin to generate return labels. Does the plugin work for other carriers other than USPS, UPS, and FedEx? For now, the plugin only supports USPS, UPS, and FedEx. But we plan to incorporate other shipping services in the future. Can the plugin autogenerate the labels once the orders are placed? Yes, you can use our ELEX EasyPost Auto-Generate & Email Labels Add-On to automatically create shipments and generate labels. The add-on will also send an email notification to the shop owner and customers. Does the plugin have an Insurance option? EasyPost API does not add insurance by default, for rates and request. But we have added an option to charge 1% of the subtotal. However, for label generation, EasyPost do charge insurance. Can I create a label for flat rate boxes? Yes. 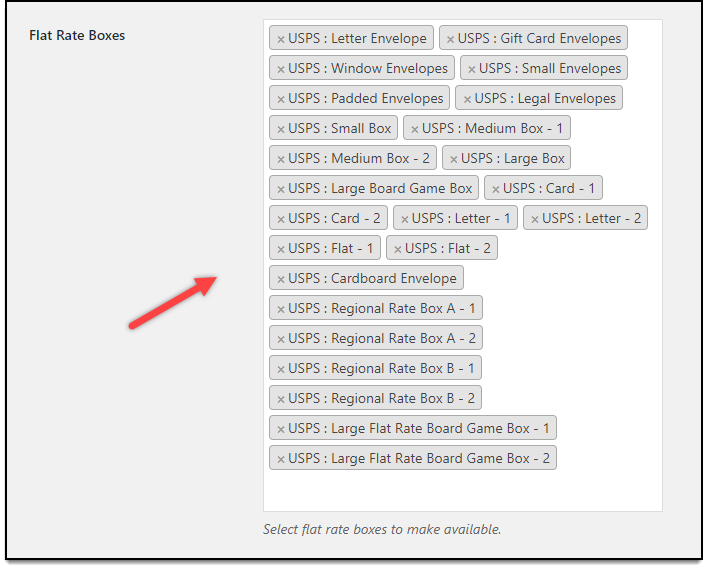 You can choose the flat rate box type to create labels for flat rate boxes. Does this plugin work for UPS & FedEx Freight shipment? Unfortunately, Freight is not supported by EasyPost APIs. Is it possible to provide insurance for the items I am shipping through UPS & FedEx? Yes. You can enable a plugin setting to achieve this functionality. Note that EasyPost charges 1% of the value, with $1 minimum amount. Can I bulk print labels? Although this plugin allows you to create shipments in bulk in the WooCommerce Orders page, we recommend using our bulk label printing add-on, as it creates multiple shipments at once and prints all the shipping labels in a single PDF file. I originally purchased a USPS plugin i was not able to use do to accounts, and minimum shipping quantities. After letting the Elex know this they gave me the correct plugin at no additional cost. This was great service, and they should be commended for that. Lorenzo has been a great help to me! I definitely recommend this product, as it’s very easy to use. If you need any help at all, he will help you! Quick response and great support by Lorenzo. Plugin (and the level of support) are great. I had an issue where I wasn’t setting the box weights correctly. I had weight and max weight both as high values. Note to anyone else w/ this issue: set the box weight to 0 or a very low value, then max-weight to the actual max-weight. After this was corrected, I saw my boxes being selected correctly based on the individual order items. Thanks, this info really saved me! Lorenzo is really helpful and helped me to set everything up for my website. really responsive, great support. Lorenzo logged onto my site and set up everything. Great customer service, thanks! Great support; so far all problems have been taken care of in a very timely matter. Cool plugin, but it has lots of bugs. When getting more than one items in your orders, the shipment label hikes up in price. Even when you assign a very minimal weight and dimension to each of your product. It does not let you do flat rate shipping.